Most couples who are trying to conceive use the basal body temperature to track ovulation. The basal body temperature is a female’s lowest body temperature within one full day. There are a few ways to track this temperature. The easiest way is to take the temperature first thing in the morning. Many women find that it’s simple to do this before getting out of bed in the morning. After taking the basal body temperature, it is recommended for the female to chart it. By charting the basal body temperature, a couple will be able to figure out the ovulation pattern after a few cycles. Get your own basal body temperature chart for free here! Basal thermometers can be found at most drugstores, grocery stores and super centers. Some of the thermometers come with a sample chart to track ovulation. Most women find that they want an easier way of tracking their ovulation temperature patterns. Some women decide to use a notebook. Other women prefer an application on their phone. Then, there are those who decide to use an Excel template. 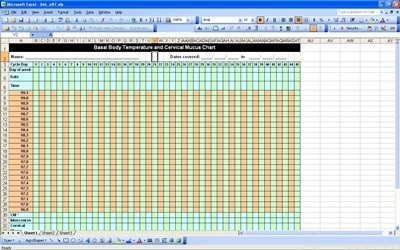 This template is one example of an Excel basal body temperature chart. Using an Excel template offers women many advantages when tracking ovulation patterns. A women should turn to this basal body temperature chart to research their ovulation charting needs. An Excel template can be used on a computer, tablet or phone. The file can be shared with a doctor or spouse. The template found here is an easy way to keep track of daily basal body temperature. Download this free calculator more basal body temperature charting ideas. There is a multitude of options for charting ovulation patterns. The use of an Excel template is one one option. After downloading this basal body temperature chart, a women should also use other tracking methods to determine the best day to conceive. Many women report conception success within months of using a basal body temperature Excel template.